Baldwinsville Village Hall is located at 16 West Genesee Street, Baldwinsville NY 13027; phone: 315-635-2481. The village was incorporated in 1848. Photo: Mrs. I. L. Crego House, ca. 1870, 7979 Crego Road, Baldwinsville, NY. Listed on the National Register of Historic Places in 2007. Photographed by User:Crazyale (own work), 2009, [cc-by-1.0 (creativecommons.org/publicdomain/zero/1.0/deed.en)], via Wikimedia Commons, accessed December, 2013. 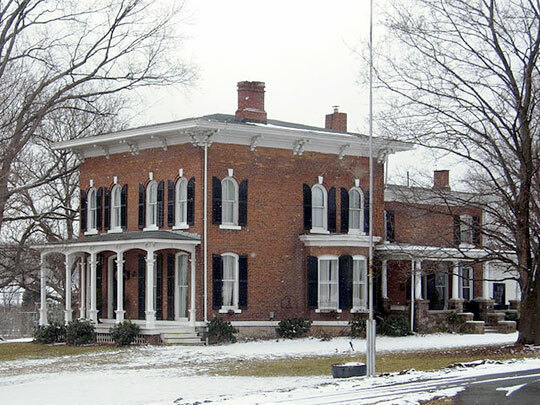 Dr. Jonas C. Baldwin established a permanent residence in the Lysander Military Tract in 1807 and acquired most of the land within the present Baldwinsville village limits north of the Seneca River. When the state laid out a road between Onondaga Hill and Oswego in the same year, Dr. Baldwin was instrumental in routing its path through Baldwinsville. By 1809, Dr. Baldwin and his sons had constructed a wing dam to develop the river's potential water power. The Baldwins were responsible for further improvements, including a canal and lift lock which provided a raceway to furnish water power, flour and saw mills along the Seneca River and a general store. The tremendous advantages of the community's natural resources lured both entrepreneurs and farmers to the nascent village. Judge Otis Bigelow arrived in 1814 and opened a general store that continued to operate until his retirement in 1864. The Bigelow family played a major role in Baldwinsville's political life and fostered the community's growth from a small pioneer settlement to a thriving rural market town. Judge Bigelow's sons, Otis M. and Payn, who also resided in the Oswego-Oneida Streets Historic District, acted as private bankers and brokers to the community before the advent of the National Bank Act. In 1872 they organized the First National Bank and three years later affiliated their financial interests with the Baldwinsville State Bank. Although the Erie Canal and railroad bypassed the village, by the 1880's Baldwinsville had become a market town for the agricultural products of the surrounding hinterlands. The excellent source of water power stabilized the community's economy throughout the nineteenth century. During this period, the economic base was diversified by the introduction of tobacco farming in 1850, new manufacturing establishments like the Morris Machine Works, and the discovering of natural gas in the area in the 1890's. Milling persisted as the dominant industry until the twentieth century. In 1868 Jacob Amos constructed the community's largest flour mill. Amos was a staunch advocate of public improvements for Baldwinsville and was the primary force behind installing a sewer system and a new railroad depot. Amos moved to Syracuse and became that city's mayor in 1892, but maintained his financial interests in Baldwinsville and returned to build a summer home within the Oswego-Oneida Streets Historic District in 1895. Harwood, John F., N. Y. State Department of Parks, Recreation & Historic Preservation, Oswego-Oneida Streets Historic District, nomination document, 1982, National Park Service, National Register of Historic Places, Washington, D.C.